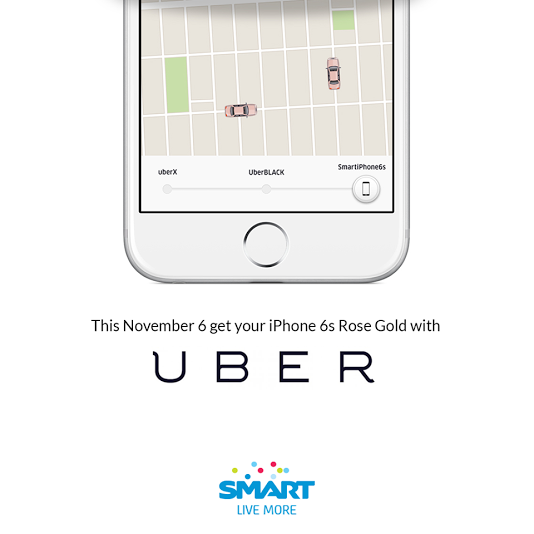 Smart and UBER Delivers iPhone 6S and iPhone 6S Plus On Your Doorstep! There's only a few hours left and I'm really excited about the release of the newest phones from Apple the iPhone 6S and the iPhone 6S Plus. I currently have an iPhone 5S and it's the opportune time to actually change to a BIGGER and BETTER phone. When the clock strikes 12, I'd be like some of you, deciding if I should slide to that Smart iPhone 6S section on my UBER app. Yes! It's so easy to order and have it delivered to your doorstep. After you download the UBER app on the App Store, open your UBER app and choose to slide the section where you choose UBER car types into Smart iPhone 6S. After choosing that, you'll get a call from a SMART Representative to verify your wish to have that gorgeous phone. Just prepare your credit and debit card plus your valid ID and wait for that UBER car to arrive. 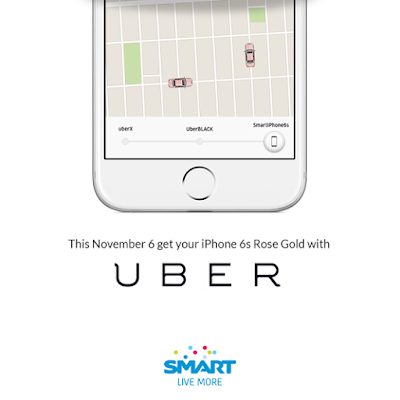 A Smart Representative will also be in that UBER ride so you can complete your transaction. You'll be a proud owner of that iPhone 6S or iPhone 6S Plus and one of the very first to own in the country. How's that for service? Best of all, these iPhone 6S and iPhone 6S Plus phones are available for Zero Handset cashout in Smart's Postpaid Plan 2000 and Plan 2500 respectively. This would be the perfect early Christmas gift for your loved ones, or your gift to self! That's just sweet! The iPhone 6S and iPhone 6S Plus is available in Space Gray, Silver, Gold and the new Rose Gold! It's starts at 12MN so make sure you do it once the clock strikes 12! That's a few hours from now so hold on your horses and order once it comes out on your UBER apps!